It’s 1989. The Troubles are raging in Ireland, bombs exploding in England. In this prequel to the Collins-Burke series, Father Brennan Burke is home in New York when news of his sister’s arrest in London sends him flying across the ocean. The family troubles deepen when Brennan’s cousin Conn is charged with the murder of a Special Branch detective and suspected in a terrorist plot against Westminster Abbey. The Burkes come under surveillance by the murdered cop’s partner and are caught in a tangle of buried family memories. From the bullet-riddled bars of Belfast to an elegant English estate, Ruined Abbey combines a whodunit with a war story, love story, and historical novel, while exploring the eternal question: what is fair in love and war? It all starts with a ruined abbey. ... authentic dialogue laced with Gaelic. ... richly developed characters ... True to the Irish tradition of great storytelling, this is a mesmerizing tale full of twists that will keep readers riveted from the first page to the last. Anne Emery is a gifted storyteller and a conscientious historian, and shows once again why she is one of Canada's finest novelists. ... a well-crafted and enteraining tale. ... 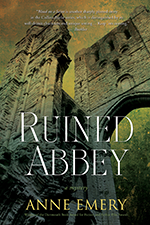 Ruined Abbey is a literate and original tale rooted in the dark history of a complex people, one well worth reading. ". . . engrossing prequel to the award-winning Collins-Burke mysteries. ... this winning mystery stands on its own. Readers who want a unique perspective on 'the Troubles' will want to grab a pint and pull up a stool next to any of the Burke clan. And fans of Emery's earlier works will enjoy seeing Father Brennan in the bosom of his feisty Irish family." " . . . eighth novel in the excellent Father Brennan Burke series. . . .This is a really tightly plotted historical with solid characters and the elegant style we expect from Emery." Bloody brilliant ... a terrific read ... suspenseful to the final page.